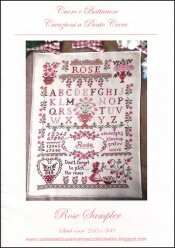 Rose Sampler [H1675] - $17.10 : Yarn Tree, Your wholesale source for cross stitch supplies. Cross stitch pattern by Cuore e Batticuore. A sampler dedicated to roses. Stitch count 210 x 300.